With more than a million visitors every year, the Fred Marquis Pinellas Trail is one of Florida's most popular linear parks. Stretching more than 40 miles from Tarpon Springs to St. Petersburg, the trail traverses several towns and waterways, connecting many state and local parks, including Honeymoon Island. In 2005, TPL purchased a two-mile corridor from CSX Transportation, Inc. that brought the trail into downtown St. Petersburg, creating a safe, convenient route for bicyclists and pedestrians to travel in and out of downtown. 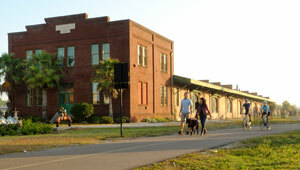 The extension passes Tropicana Field, home to the Tampa Bay Rays baseball team and the historic Seaboard Coastline Train Depot, which currently houses the St. Petersburg Clay Company, a world-renowned clay art studio.